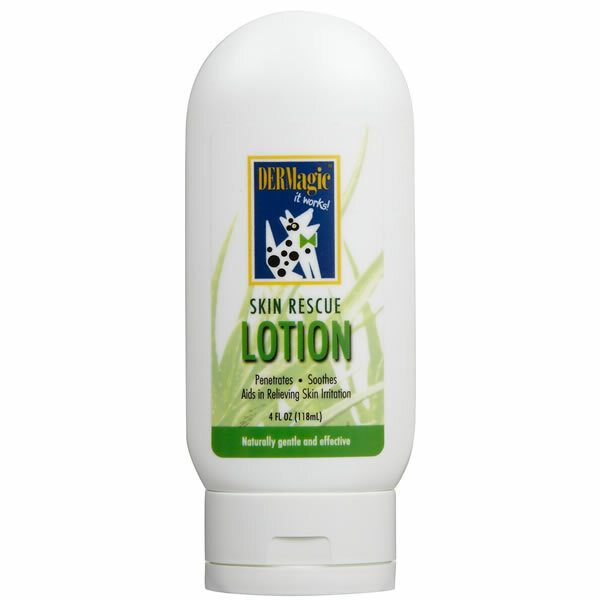 DERMagic Skin Rescue Lotion can give your dog fast and effective relief from skin irritations and dry skin conditions. Bacteria and fungus can cause itchy skin which can then lead to hot spots, hair loss and dermatitis. The Skin Rescue Lotion contains organic whole-leaf aloe vera gel and vitamin E rush healing energy to the deepest layers of the skin, while sulfur reduces itching and flaking associated with seborrheic dermatitis and dandruff, is toxic to the scabies mite, and contains both antibacterial and anti-fungal properties. Rosemary essential oil disinfects and stimulates hair follicles. Sesame oil, a natural antibacterial for common skin pathagens (such as staphylococcus and streptococcus - both of these are a type of bacteria which cause skin irritations and hot spots in dogs), as well as common skin fungi (including yeast infections), is also a natural antiviral and anti-inflammatory agent. It is best used when there are large areas of irritation. 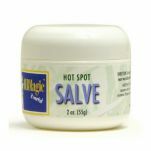 For small areas or hot spots, use the DERMagic Hot Spot Salve. For best results please use following a natural pH balanced, anti-bacterial shampoo treatment such as the DERMagic peppermint & Tea Tree Oil Shampoo. 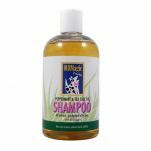 Bathe your dog (weekly during treatment) with a natural pH balanced antibacterial and anti-fungal shampoo for fastest results. Continue application once daily for another week. When skin condition begins to improve, switch to DERMagic Hot Spot Salve applying daily to affected areas until no longer needed. For ear infections - Apply a small amount using finger (as far as it will allow). The heat inside the ear will make the product travel further to solve the problem / itchiness / smell etc. If your dog licks the lotion off, just reapply as needed. There is nothing harmful or toxic in this product, it's all natural. 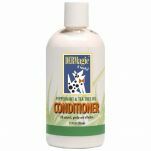 Bathe your dog with DERMagic Peppermint & Tea Tree Oil Shampoo and Peppermint & Tea Tree Oil Conditioner. Use the Skin Rescue Lotion for 2 weeks. Sesamum indicum (sesame oil), certified organic aloe barbadensis (aloe) leaf gel, lanolin, flowers of sulfur, olea europaea (olive) oil, beeswax, organic Butyrospermum Parkii (shea butter) fruit, rosmarinus officinalis (rosemary) leaf extract, natural alpha tocopherol (vitamin E). 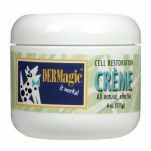 Read 5 customer reviews of DERMagic Skin Rescue Lotion. The average customer rating is 4.8. I purchased DERMagic Skin Rescue lotion and am using it in conjunction with the DERMagic Peppermint and Tea Tree Oil shampoo and conditioner. Prior to using these products I had tried numerous different products with varying degrees of failure. The DERMagic range has given Riley more relief for her skin allergies than anything else I've tried and as it is soothing she is happy to have it applied. It smells great too. My 15 year old dog is always chewing and scratching himself. I rub the DERMagic Skin Rescue Lotion on his stomach & legs and afterwards he licks it off. However it has seems to have reduced the level of his chewing & scratching. When I can afford it I will have to buy the shampoo as the Malaseb hasn't helped him. Looking hopefule so far. My 16 years old German Spitz had awful black spots and yeasty smelling skin, the lotion is rubbed in twice a day and I bathe him once a week in the DERMagic shampoo followed by the conditioner. I noticed a difference immediately. Now after 2 weeks the black is fading markedly. For any crusty spots I use the restoration creme which I have even used on an itchy bit on the bottom of my foot. Brilliant range of products, very happy. The difference is amazing, he had black skin all over his tummy groin arm pits some on his back where he had also lost his undercoat, he is 16. In between Malaseb baths he would get crusty red spots. The terrible thing about Malaseb is its harshness and you have to leave it on 10 minutes before rinsing. I do not need to cover him after rubbing the lotion as it it seems to soak in. What a godsend these products are. Recommend you use this product after shampoo and conditioner to leave your dogs skin and hair beautifully hydrated and silky smooth. Also great for soothing any skin irritations. Great product.